A cancer diagnosis is immobilizing. It may feel as if you went to sleep and awakened in a foreign land. The people are different. The language is different. The culture is different. The decisions you make and how you make them are different. At PetCure Oncology, our focus on the pet patient and their family begins with empathy. We understand how overwhelming and difficult a cancer diagnosis can be. Therefore, our first task is straightforward: make the complex simple. Just as in human medicine, cancer care for pets is complicated and intricate, no doubt. We try hard not to get swept away in our own complexity. 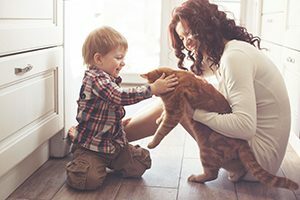 We project ourselves into the shoes of the pet family and walk with them down a decision pathway that is as empathetic, compassionate and uncomplicated as possible. Their decision may be to seek treatment from us, or it may not. At PetCure Oncology, we deeply value the importance of quality of life and build our services to deliver life-changing care with minimal side effects. Many of us bring our experiences and perceptions from the human side of cancer care. We have seen the ravages of treatment side effects. Fortunately, those side effects are greatly minimized, or even eliminated, with recent advancements in veterinary cancer care. What we know for absolute certain is that we are not perfect. We live in the world of cancer and we do not underestimate its unpredictability. But we believe passionately in our solution. We understand that stereotactic radiosurgery (SRS) sounds scary, but it is actually just the opposite – especially when compared with more traditional radiation treatments. SRS is easier and faster, with fewer side effects and better long-term outcomes. We also know for absolute certain that SRS treats cancers previously considered untreatable. We can treat areas of the body formerly thought to be unreachable. That is a big deal to us, and we believe that we have an ethical imperative to tell as many people as possible that there is indeed hope. That is the very least we can do for our pet families. All these benefits almost guarantee a better quality of life, which is critical in making decisions about a pet we love. In the end, what we do is only and always about what is best for each family. Meet a few of our families whose pets have received treatment from PetCure Oncology on our Client Testimonials page. This personal blog entry was contributed by Jack Moore, PetCure Oncology’s Chief Marketing Officer. Jack recently joined the PetCure team after lengthy and successful stints as the chief marketing officer at Cancer Treatment Centers of America and the VP of Field Marketing at Four Seasons Hotels and Resorts.